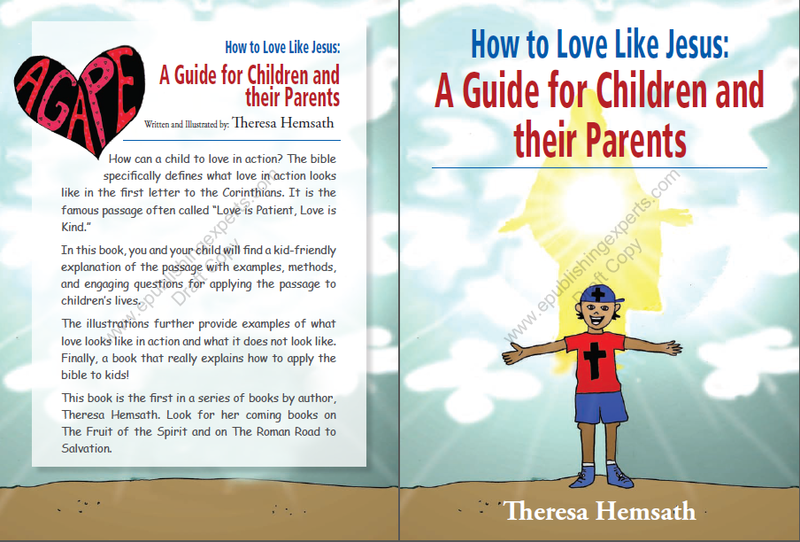 The front and back cover of How to Love Like Jesus: A Guide for Children and Their Parents. It’s pretty easy to see that kids struggle with selfishness and impatience among other things. So when I was up to my neck in frustration, I went online to find a good book that would teach him what love in action looks like. But it was not there. I found a couple of narratives that were based on Paul’s letter to the Corinthians about love, but it was very sing-songy and vague in the story-line as to how a child can actually act out these characteristics Paul describes as love. I soon realized I needed to write the book myself. How to Love Like Jesus: A Guide for Children and Their Parents is a one-of-a-kind children’s book because it is non-fiction, explaining what “agape” love looks like through close analysis of the 1 Corinthians 13:4-7 verse. Love is patient and kind; love does not envy or boast; it is not arrogant or rude. It does not insist on its own way; it is not irritable or resentful;b it does not rejoice at wrongdoing, but rejoices with the truth. Love bears all things, believes all things, hopes all things, endures all things. Each describing word of love is explained in kid-friendly language with examples that are applicable to their lives. The full-color illustrations provide further examples as well that are relatable and even funny. My children love to read it together and on their own and those who have bought the book have found that their children feel the same. Some of the parents have even shared how much they have learned themselves about love. The book is available as a Kindle on Amazon as well as in a 32-page paperback. I’ll be working to getting the paperback on other distribution sites as well over time. For more information on the book or to read up on the process of getting it published as well as different campaigns and deals on the book, check out my blogs on the book under the category Children’s Books. Overtime, as I publish more books, those too will be found under the same tag.